I gave the original Bioshock Infinite a 10, but Burial At Sea Part 1 had its shortcomings. Taking place in a small subset of Rapture, there wasn’t too much to do, and it was all over quickly. The end being what it was, it set itself up perfectly for Part 2. After finishing this part, I can say that but for one or two notable missteps, which I will detail, I was blown away. This was so much fun, and the ending literally knocked me out of my seat. I fell out of my seat, I really did. Burial At Sea Part 2, if you can believe it, is the definitive final piece of Bioshock. As was said long before Part 1 ever came out, Part 2 has you playing as Elizabeth. If you’ve played Part 1, it should be obvious as to why, but I want to say something right here. I don’t feel like you have to play Part 1 to know what’s going on. So long as you’ve played the original Bioshock Infinite, the beginning of the episode has a quick wrap up of Episode 1, that tells you all you really need to know. As Elizabeth, you don’t have the shields that Booker DeWitt did, and you don’t have his health bar. Also, since you ARE Elizabeth, no one will be there to help you when you get in a jam. If you die, the last checkpoint reloads. Note the gauge above the foe’s head letting you know if he has seen you. Also note you are totally invisible. You’ll only get a few guns; the hand cannon pistol, the shotgun, and the radar range from Part 1. In addition, Elizabeth wields a crossbow that can use three different types of ammo to knock out or distract enemies. That’s right, this time the combat is stealth-based and I love it. Crossbows are essentially a 1-hit kill with a very limited ammo supply, but you’ll dart and duck out of the way of your foes, who know have indicators over their heads to let you know if they have spotted you or are actively looking for you. If you can sneak up on an enemy who has not seen you, you can press melee for an instant kill, but enemies who have guns trained on you cannot be meleed out. You also don’t have any ability to open Tears, so you’re on your own each time you go into battle. What changes the tide of battle are your plasmids. Old Man Winter and Possesion return, but you’ll also get Ironsides, which deflects enemy bullets and adds to your ammo count. What you’ll use the most, though, is Peeping Tom. It turns you invisible and highlights enemies through walls. A few upgrades you’ll get remove the Eve cost for using it while standing still. In other words, one on one you are basically unstoppable if you plan it right. I think stealth can be fun when you are given more tactical information, and Peeping Tom is strong, bordering on broken. However, given the number of times I died on hard dfficulty, it’s clearly not broken. Burial At Sea Part 2 also introduces a new difficulty level called 1998 Mode, where you’ll have to use stealth-only methods to proceed. All in all, Bioshock Infinite Burial At Sea Part 2 lasts about 4-5 hours, more than double the length of part 1. You’ll have much more room to explore, and there are many optional areas that give you power-ups for your plasmids, audio logs, and equipment. It feels like there’s a lot to do. 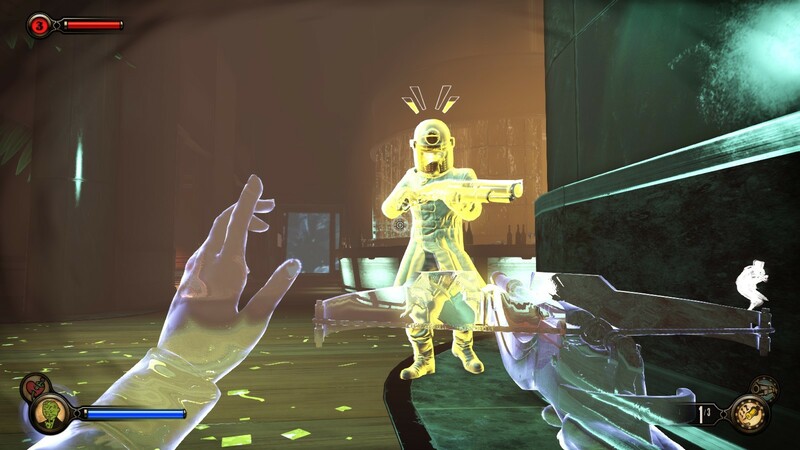 The combat is way more fun than anything I experienced in Bioshock Infinite, which I previously said had the best combat in the Bioshock franchise. Number one: Daisy Fitzroy. This polarizing character took a child hostage about two thirds of the way through the original Bioshock Infinite, forcing Elizabeth to kill her. It was meant to show that both sides of the conflict between Comstock and the Vox Populi were not infallible. Well, gosh golly that was retconned. Soon after Elizabeth finds her way back to Columbia, she eavesdrops on Daisy Fitzroy while crawling through a duct. She is talking to the Lutece twins, telling them that there is no way in hell she will hurt a child, but they convince her to do it in order to goad Elizabeth into killing her so she can get the blood on her hands she needs to go confront Comstock. 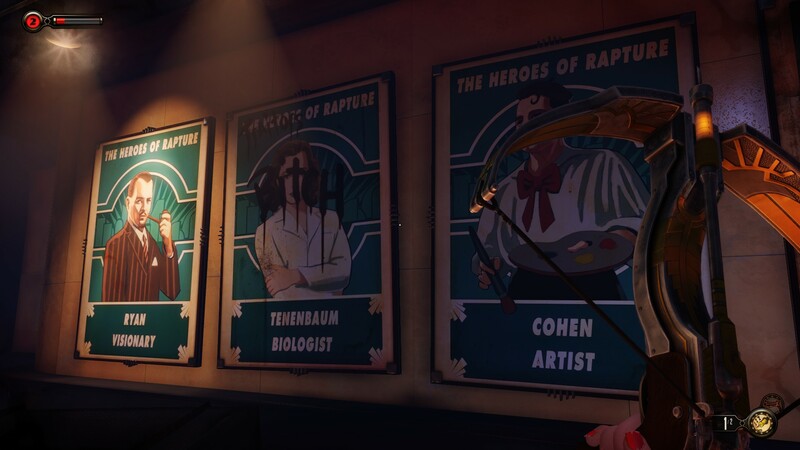 It is awful to look at and painful and an unnecessary retcon of a very important part of Bioshock Infinite. Number two: Right as the DLC begins, you find the Elizabeth from Part 1 dead. So what Elizabeth are you? Apparently, you’re all Elizabeths that are left. combined into one person, who has no omniscience, no ability to open tears, and no knowledge of the alternate universes and their possibilities. Well, you might have a little left, but it’s trapped in your subconscious. Even so, there are a lot of holes as to how this Elizabeth got here. I found it easier to just nod my head and go on. That being said, it feels like there are several story beats in this DLC, as opposed to the the opening and conclusion in Part 1. I liked every moment of it, but when I got to the ending, I was blown away. I loved it. As opposed to the ending of the original Bioshock Infinite, this one had immediate impact, was easy to understand, and was a great, just fantastic moment, especially for a franchise fan. Play this and play it now, it’s the best Bioshock has ever had to offer. Ted played Bioshock Infinite Burial At Sea Part 2 at High settings on his PC, which is outfitted with a Radeon 7870, a Core i7 processor, and 12 GB of RAM. He did not receive a review copy from the publisher.